I just bought a new Kodak Z812is camera after doing a lot of research. It does everything I want it to, and in the last couple days owning it, I find it does something Id rather it didnt. And of course, Kodak support is totally useless. Now I should let you know that I'm not totally new to digital cameras, I have purchased 5 since 1999. Toshiba, Fuji, Olympus, Canon and now this Kodak. I've also shot 35 and medium format film since the early 70's and had a complete color &amp; bk/wht darkroom in my house for years. Im not a pro, but Im not a novice either. The first problem occurred just hours after getting the camera. I read through the "manual" for lack of better word. Its not very informative. I went to their website as the manual suggest for more info. I download the PDF. It was just a pdf of the same manual, and most of the online stuff is more of the same. Anyway, after shooting some photos I wanted to put them on my laptop. First of course I install the provided software. Just incase there are some cool options I might like that I wont know about due to the lack of info in the manual. Then I plug the Kodak supplied USB into the Z812is and then plug it into my now 9 month old Acer Aspire 5100-3583 laptop. I turn on the camera and nothing. As I start to look in the manual with little hope of finding anything useful, I smell something strange. I sniff the camera, then down by the USB port on my laptop, which was quickly followed by a abruptly pulling the USB cable from the laptop, and then the camera. I sniffed the computer end of the USB cable and it smelled of smoldering plastic, but appeared in good shape. I then used my sniffer around the camera and it smelled , new. The side USB port on my laptop smelled horrible. Being stupid, I plugged in an old MP3 player I had into the side usb port on my laptop, and nada. I then plugged it into the rear ports and it worked fine. This really sucked as I use the side port almost exclusively as it is really a convenient location, and now its toast. I emailed Kodak about this, and after about 4 days they replied by telling me I might want to try their online help data base, or if that didn't work, I could call their 800 number. I return home and shoot some photos. They were ok, but I didn't shoot anything to challenging. Then.. This afternoon I shot a few pictures of my daughters leaping cross couches in the family room and I noticed another problem. 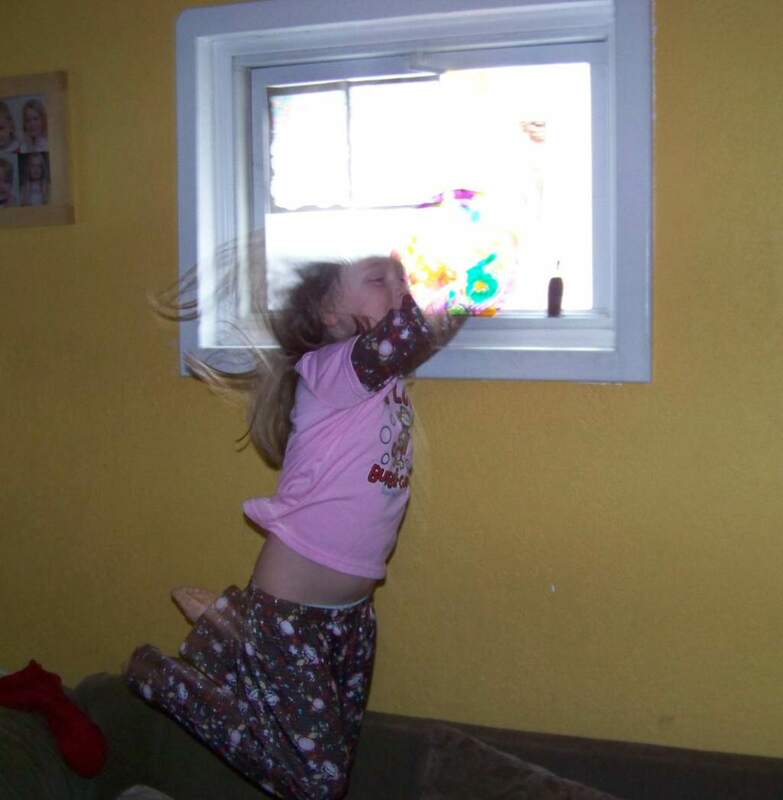 In the photos where my daughters are flying in the air past a sunlit window, their heads all but disappear?? I used the flash and had the camera set on auto with the red eye flash option turned off. I would not have expected anything like this, and I've never seen it with any of my other digital cameras in the past. 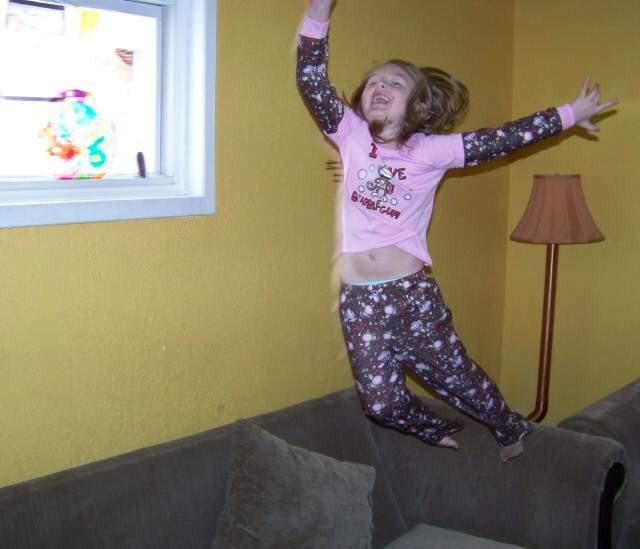 And I have taken other photos of my leaping daredevils in the family room, on that same couch in front of that same window. I even looked, and I cant find one that ghost like these did. Between the cable toasting my usb port, the obvious lack of care and support from Kodak, and now this, I am really beginning to dislike Kodak. A lot. So the usb story is more a warning than anything. I know what caused that, and like I said, Im sure Kodak won't be nice enough to want to make it right. I bought the expensive replacement thanks to Kodak not wanting to use a standard style of usb like most digital's I've seen have. I guess there isn't as much money in going with a standard connector as there is in inventing your own. But maybe they will learn like Sony did with having proprietary gadgets ,like their memory stick. But my more immediate concern is .. Why are parts of my kids heads missing and other parts ghosted? And its not restricted to shots with the window in the background. On some, but not all, parts of hands, legs, torso, ectâ€¦ will show up as ghost, but not totally missing. Only when the window is in the background does that happen. Any idea? Help? Constructive Suggestions? Photo, I cropped it and scrunched it a little to keep the size down. Im new here, so Im wondering. whats with the White Box over the where model numbers are? Is this a legal CYA? I don't know what's causing your daughter to loose the top of her head, but I had a similar experience with a USB port. In my case, it blew out the power on Fugi 602 camera. Repair cost = $185. So now I always take the memory card out of the camera and use a card reader to transfer photos to my PC. No special software required. Was the flash set for Auto or Fill (Always Flash)? Can you post the EXIF data? By the way my only toasty USB experiences have been the other way around, the computer's USB port toasting the device plugged into it. Good call.. I pulled up the EXIF file and noticed that the shutter speed was on 1/30 at 200 ISO?? That could explain why parts are missing. especially were the background light from the window is so intense. If its looking for low light and is confused with not only bright light but movement as well, it may do just what it did. But why it would set itself like this on Auto has me a little baffled, and its not like the room doesnt have good lighting. And as you can tell from the window, the sun was shining the other day. But why it would pick this setting I am not sure. And I have the latest firmware version too. As for the USB on my computer, I know it was good because earlier that day I transferred a recorded biology lecture from my biology class just the day before . So I just cant see it suddenly being defective. Im thinking its the cable. but thats a moot point now at least where Kodak is concerned. They wont even talk about it. As for the missing body parts in the photo, I sent the photo and a description to Kodak support. They sent back saying this was over their expertise. ??? I take it that it does not take much to go over Kodak supports level? Shame being as they were the first big name in photography. Oh, and the white blocked out text where z812is was, is now showing.. I dont know why it was, but it isnt now and thats fine with me. Your analysis is good. In normal auto-flash mode, when the camera decides to flash the lens is set at f/2.8, shutter at 1/30 and exposure is controlled by modulating the flash output. That's not an uncommon programming but with an overpowering backlight resulted in both the ghosting and as you point out complete sensor overload. In the auto mode the camera is expecting to control exposure with the flash but light from the window took away that ability. Two solution, avoid this kind of backlighting or in this case you might have tried "always flash" which is actually a fill flash which MIGHT have resulted in a better balance between ambient and flash. Here is one with the window in the other direction where it has a glowing eerie type fx. Interesting. I guess you can call it a kind of â€˜ Ghost in the Machine â€˜ fx ?? I can get this effect with my old DC5000 when I use fill flash mode which can really slow down the shutter speed and had it on my Z612 with the fill flash mode ( in both cases allowed the shutter speed to drop to the 1/10-1/15 range.) In your situation I'd experament with shutter priority, setting the shutter at 1/60 - 1/125 sec. and setting the flash to always flash. You may need to up the ISO to 160 and crank in a little + flash exposure compensation. These last two suggestions are base on a few trials I ran tonight using shutter priority and flash with my Z612. This is my daughter! I have 2, 5 &amp; 8. I got started late, and Im learning that lesson. Well worth it though. What bothers me about the whole thing is that this is on the AUTO setting. Where the camera decides. I cant change anything on that setting. at least I dont think I can. Kodak manual for the Z812is is the closest thing to useless Ive seen in years. And online support isnt much better. I've gone through the EXIF data of a pretty fair number of flash photos taken with my Z612 in auto mode, especially those with strong back-lightingand it appears that the Z612 and the Z812 are programmed the same. At 35mm equiv. focal length the lens is wide open and the shutter is 1/30 sec. As the lens is zoom toward the tele end and the max aperture is reduced the lens is still wide open for whatever value that is at the selected focal length and the shutter speed is raised, as much as 1/200 at max telephoto. I have also checked some shots taken with an Olympus Stylus an its behavior is consistent with the Kodaks.